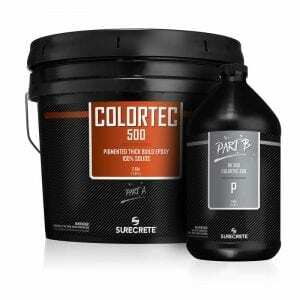 ColorTec AcrylicWB™ is a colored water-based outdoor concrete paint and sealer. Acrylic 30% solids, low VOC (less than 100 grams per Liter), strong binding, color, satin acrylic sealer for overlays or any cement based product. Our water base colored concrete sealer contains a hybrid, self-cross-linking, acrylic resin with built-in water repellents and tenacious penetration and adhesion. It contains no wax or silicone additives. Pigments are specifically formulated for UV stability, will not blush, and retain long gloss retention. Pigmented WB is non-flammable and environmentally safe. ColorTec AcrylicWB™ is a colored water-based concrete paint and sealer. Acrylic 30% solids, low VOC (less than 100 grams per Liter), strong binding, color, satin acrylic sealer for overlays or any cement based product. Our water base colored concrete sealer contains a hybrid, self-cross-linking, acrylic resin with built-in water repellents and tenacious penetration and adhesion. It contains no wax or silicone additives. Pigments are specifically formulated for UV stability, will not blush, and retain long gloss retention. Pigmented WB is non-flammable and environmentally safe. With all of the issues plaguing colored acrylic water-based concrete sealer applicators and contractors, we decided to make a sealer that was specifically formulated to deal with these issues effectively. ColorTec Acrylic WB was designed to help eliminate two of the biggest issues pertaining to acrylic concrete sealers: peeling due to constant exposure to freeze and thaw cycles during the spring and fall seasons of certain environments and color instability due to Ultra Violet light exposure. SureCrete’s colored acrylic water-based concrete sealer, Pigmented WB out-performs all of the competition in these regards, all while remaining an eco-friendly green alternative to normally hazardous and caustic coatings typically used. SureCrete’s tinting system creates water base colored concrete sealer which is far and away the best available products in the decorative concrete industry. The tints used by our patented coating coloring station are more durable and provide better UV resistance than any other water-based pigmented concrete sealer. Utilizing these pigments specifically designed to work in concrete sealer coatings, your finished water-based colored acrylic exterior paint will last longer than a typical acrylic sealer ever could, with the color staying more vibrant, even after long periods of UV exposure and the elements. As if that weren’t enough reason to try these colored water-based sealers, our tinting stations also allow for a much wider array of available colors than has ever been available for water-based concrete paints. Pigmented water base colored concrete sealer is available in more than 200 standard colors and every single one of these colors and more are available same day from any of our ON DEMAND locations throughout the United States and Canada. 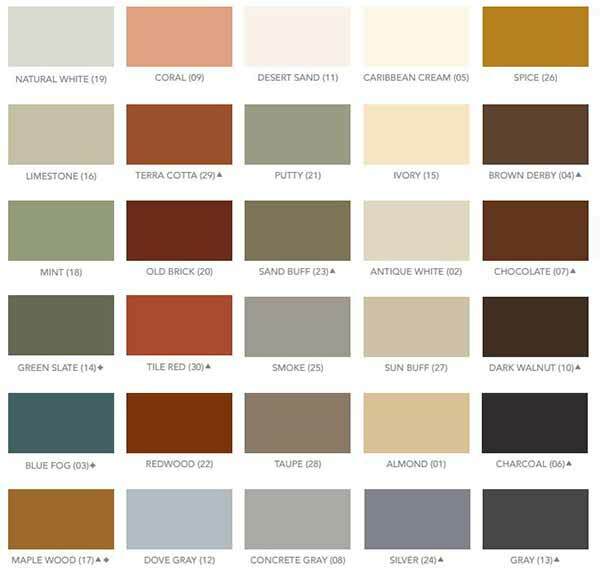 We can even match your color palette from a different manufacturer such as Sherwin-Williams, Dupont, Baer, Valspar or Scott Paints. Or, if you’re looking for that truly unique palette, we can also perform themed color matching such as University colors, Professional sports teams or perhaps even your favorite movie or television show! Just come in and try our water base colored concrete sealer for yourself, we guarantee our product will help you create your ideal floor coating! 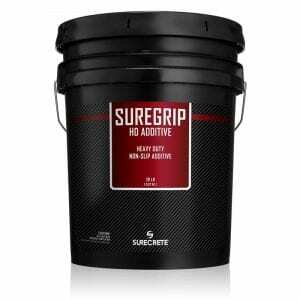 How Do You Apply SureCrete’s ColorTec Acrylic WB™ Water Base Colored Concrete Sealer? SureSeal water base colored concrete sealer can be applied by roller, airless sprayer, and pump-up sprayer. Whatever your application technique, make sure to apply thin, even coats over your surface. Two coats are typically suggested with any exterior acrylic sealer project, with the second coat being applied at least 24 hours later, in the same manner as the first. 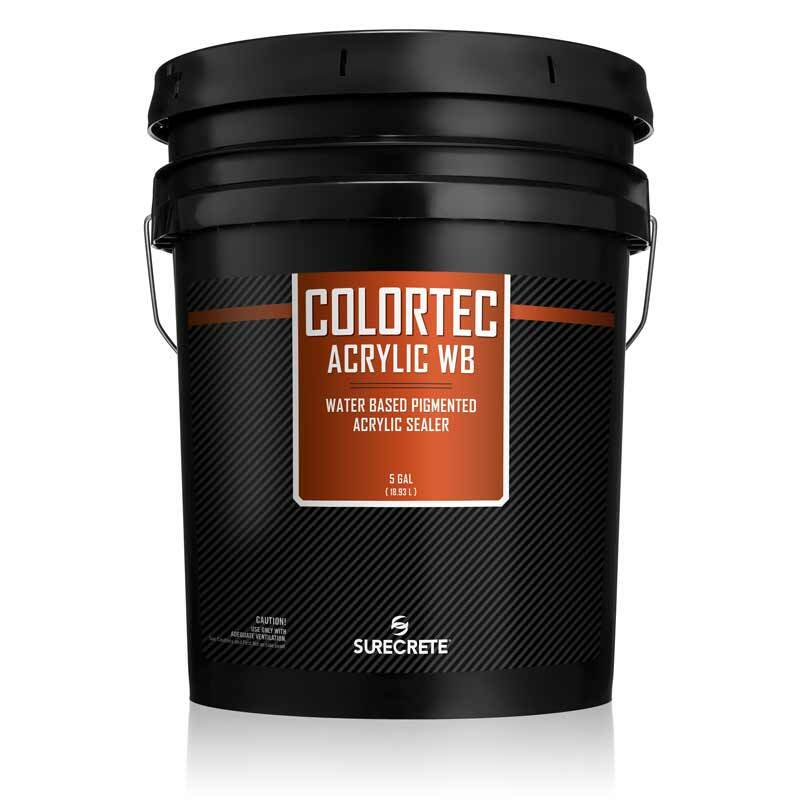 Question: Can you match a color with ColorTec AcrylicWB™ Water Base Colored Concrete Paint? Answer: Yes! Just make sure to get a physical color chip to one of our On DEMAND distribution centers. 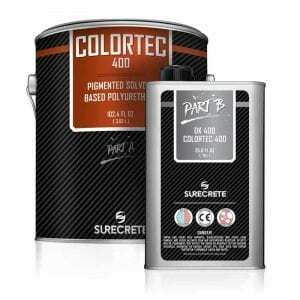 ColorTec AcrylicWB™ Colored Concrete Sealer be used as a single-coat system? Answer: Technically yes, however, it is not suggested. Proper hide and substrate protection require two thin coats of water base colored concrete sealer product. 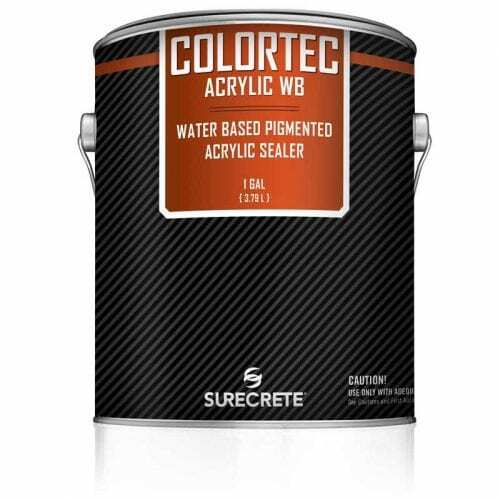 ColorTec AcrylicWB™ Water base colored concrete paint sealer self-level and fill small holes? Answer: No, acrylic sealers were not designed to meet this application criterion. Question: Will Pigmented WB Colored concrete sealer survive the freeze/thaw cycles in my area? Question: Does the Low-VOC nature of Pigmented WB Colored Concrete Paint eliminate odors as well? Answer: Almost completely! This is one of the main attributes of any water-based coating system: little to no aroma!